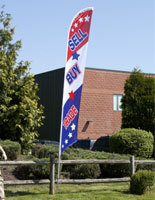 These Auto Dealer Flags are 14 Feet Tall! This Display is In Stock Now! 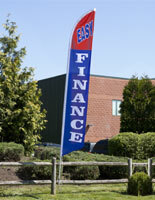 These Auto Dealer Flags are Eye Catching! Single side dyed through printed banner with mirror image on back for an eye catching display. 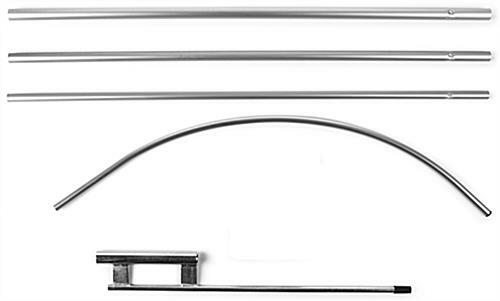 4-Piece aluminum pole is low cost compared to the "deluxe" model. 14' Height and bold red text for easy to read signage. These auto dealer flags that have a printed message come with a poly knit banner. This signage is 14 feet tall so customers driving by can read the pre-printed message. 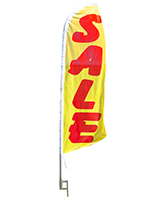 These auto dealer flags that are for outdoor use come with a metal ground spike. This promotional swooper is red white and blue for businesses to show American spirit! 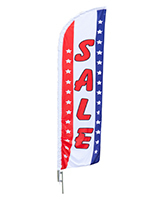 These auto dealer flags are an affordable and convenient promotional tool for used car establishments. This red-text advertising banner is sure to attract car buying customers. 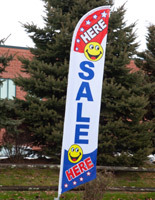 These promotional banners, auto dealer flags that are tall can be seen by passerby customers whether in a car or on foot. The included poly knit pennant is feather shaped and the red, white and blue colored message is bright. 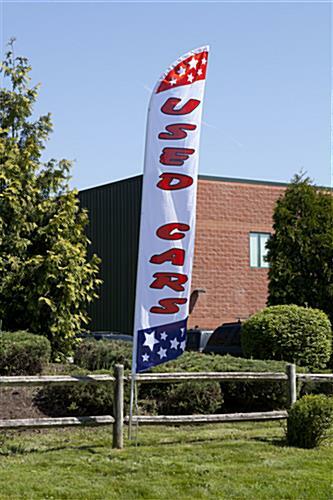 These auto dealer flags include a curved-at-the-top pole that easily pieces together and is designed so the banner is always visible, even in the wind! This message display is simple to use and purchasers do not need to think of a custom graphic for these pre-printed advertising displays. These ground installing auto dealer flags, also known as a feather swooper, are perfect for storefront landscaping displays. 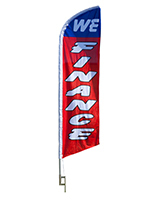 This economy banner is more affordable than comparable displays due to the use of an aluminum pole. 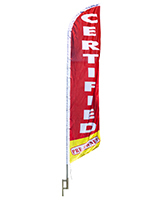 The aluminum poles used with these auto dealer flags are lightweight for easy portability, but tend to weather in the elements. The included carrying case is useful to transport this display indoors during inclement weather. These red and blue auto dealer flags are vividly colored. 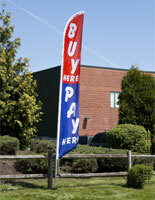 This economy version message banner is for outdoor advertising use!